Only a very select group of club teams have ever won a league title (or more) in a different country than their own. The reason for competing in that other country can be divers, from strange to obvoius. In two articles I portrait nine of those league winning teams, in chronological order. If a club wins such a title more than once, I concentrate on the first one. Now: Part One, 1924 until 1961. Officially Huddersfield Town was crowned English league that year, Welsh club Cardiff City finished second. Both had 57 points and the same goal record of +27 (Huddersfield Town 60-33, Cardiff City 61-34). In those days they let the goal average decide the title, and so Huddersfield Town (1.818 goals per game) won over Cardiff City (1.794 goals per game). Nowadays Cardiff City would have won because they scored more goals. Anyway, Cardiff City had a great team in those days, with not only players from Wales. Bill Hardy, Jimmy Gill (15 league-goals during the season) and Joe Clennell (11 goals) were from England, old Jimmy Blair (35 years at the time) and Jimmy Nelson were Scottish internationals and goalkeeper Tom Farquharson hailed from the Irish Republic. Captain Fred Keenor and inside-left Len Davies were the Welsh players that impressed. The battle for the title was close during the whole season. With just one match left to play, Cardiff City were one point ahead. As Huddersfield Town won their last league match, Cardiff City also needed a win against Birmingham City to clinch the title. Considering the mathematics of those days, any draw with more than 2 goals (2-2, 3-3, et cetera) would also be sufficient. It ended 0-0. The best opportunity of the afternoon was a penalty. 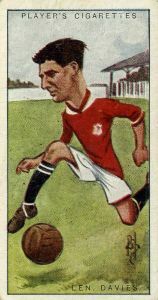 As nobody dared to take it, Len Davies, top scorer of the team with 23 league-goals, reluctantly walked towards the penalty-spot. He missed. Note: Cardiff City did win the FA cup three years later (1-0 against Arsenal), to this day the only non-English club to do so. Amazingly, looking at their recent track record, the Philippines were one of the first soccer playing countries in the Far East. Their league started as early as 1911. Once in a while, before World War Two, the Philippinian FA sent invitations to British army teams and visiting ships based in the region to take part in their National League. 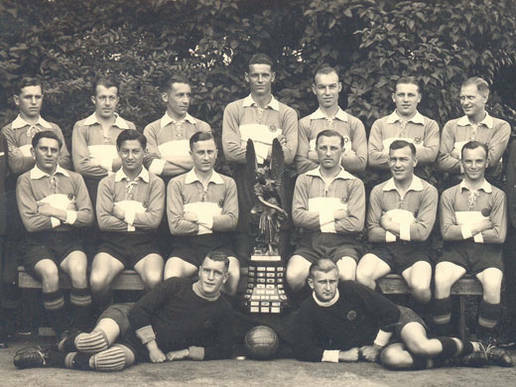 In 1935 they even sent two invitations: one to the British military team Malaya Command, that was based in Singapore and one to the N.I.V.B., the soccer federation of Dutch India, that responded with a team from Soerabaja. As the city federations from Western and Central Java had just left the central federation recently, the N.I.V.B.-team wasn’t as strong as expected. The championship was held in February and March 1935, and consisted of seven clubs. By easily winning the Austrian title (the German occupation called it the Gauliga Ostmark), Rapid Wien qualified for the finals of the German championship. At first they played in a group of four, with Stuttgarter Kickers (champions Gauliga Württemberg), Vfl Neckerau (champions Gauliga Baden) and TSV 1860 Müchen (champions Gauliga Bayern). Rapid Wien played 1-1 at home against Stuttgarter Kickers and lost 2-0 to 1860 München. They won the other four matches, included the last and all important one, 2-0 at home against rival 1860 München. 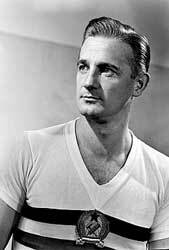 Of course Franz ‘Bimbo’ Binder scored a goal, as did Hermann Dvoracek. With this result, Rapid Wien entered the semi-final, where Dresdner SC was the opponent. The game was played in Beuth, on June 8, 1941. Dresdner SC had a formidable attack, with Horst Schade and Helmut Schön, the later famous national coach of Germany. Again Franz Binder showed his talent, scoring both goals in a 2-1 win. Two weeks later, Rapid Wien faced Schalke 04 at the final in Berlin. Ninety-five thousand spectators saw an exciting game in which, for the first hour, Schalke 04 was superior. Goals by Eppenhof (2) and Hinz resulted in a 3-0 lead. Then Binder took his team by the hand. Rapids famous ‘fifteen minutes-rage’ started – they tended to have fifteen minutes every match in which they trashed their opponent. This day they only needed ten minutes. First Georg Schors scored 3-1 (60th minute). Then Binder scored a freekick (62th minute) and a penalty (63th minute). From a corner Binder also scored 4-3 with a thundering shot. After that, Schalke started a furious attack on the Rapid-goal I which goalkeeper Rudolf Raftl, the other Rapid-star next to Binder – was unbeatable. Herbert Burdenksi came close, but his shot only hit the bar. Rudolf Ratl (8 matches/ 0 goals during the finals) - Stefan Wagner (7/0), Heribert Spener (8/0) – Franz Wagner (8/0), Leopold Gernhardt (5/0), Stefan Skoumal (8/0) – Wilhelm Fitz (8/1), Georg Schors (7/8), Franz Binder (8/11), Hermann Dvoracek (5/3), Johann Pesser (2/0). During World War Two, Hungary annexed a few regions that were once (before the First World War) part of the Austrian-Hungarian monarchy. From one of those regions, Erdély or Transsylvania, Nagyváradi AC entered the Hungarian league at the start of the 1940-41 season. Other ‘foreign’ clubs in those years include Kolozsvár AC from Cluj, Rumania and Ujvidéki AC from Novi Sad, Yugoslavia. 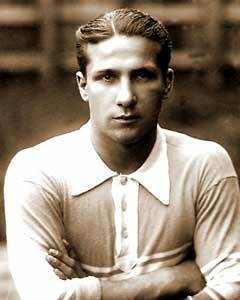 Nagyváradi AC already came close to the title in 1942-43, trailing just three points behind champions Csepel WMFC. A year later Nagyváradi won the Hungarian league by a landslide, finishing on 49 points from 30 matches. Second placed Ferencvaros could only manage 36 points. 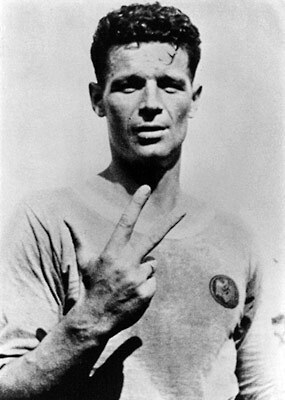 Goalkeeper Adolf Vécsey, defender Ferenc Mészáros and attackers Ferenc Sárvári, Gyula Bodola and Mátyás Toth III were ever-present during the campaign, Andor Onody I and Rudolf Deményi only missed one match. Upfront Sárvári (23 goals), Bodola (15 goals), Tóth III (14 goals) and Gyula Lorant (11 goals in 25 matches and later in life a famous coach in Germany), scored most of the goals. Nagyváradi couldn’t repeat their success in Hungary, as the next season was abandoned after just three matches. After the war, the club ‘travelled’ back to Rumania, and won the Rumanian league as IC Oradea in the 1948-49 season. Of course, Monaco is too small (2,2 square kilometres) for its own league. So soccer club AS Monaco was keen on playing in neighboring France. 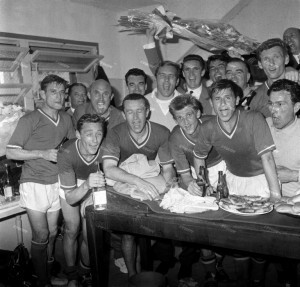 In 1953, the club was promoted to the highest level for the first time. 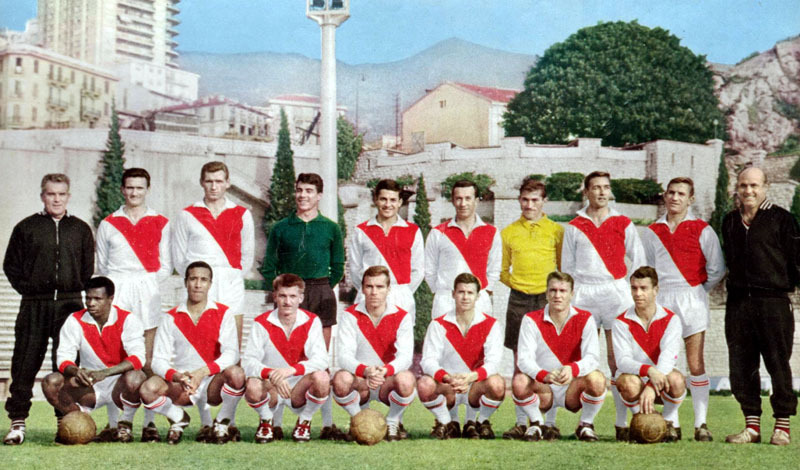 AS Monaco soon established itself as a major force, and in 1961 took the French title for the first time. It was the first season they played in the famous diagonal red and white shirts, that was designed by Princess Grace (Kelly). After winning their first seven matches of the season, AS Monaco began spilling points, with Racing Paris getting ahead of them. After Round 36, the two teams were level, with Racing Paris in the lead on having a better goal difference (90-54 compared to Monaco’s 75-41). Both teams only managed a 1-1 draw in Round 37, so round 38 proved to be decisive. While Racing Paris only managed a 1-1 draw against Stade Reims, AS Monaco won 1-0 at home to Valenciennes and took the title. The AS Monaco-team of that year: goalie Yvan Garofalo (31 matches/0 goals), defenders Marcel Nowak (34/0), Raymond Kaelbel (26/4) and Francois Ludo (37/0), midfielders Henri Biancheri (37/2), Michel Hidalgo (33/5, and for the third time this article another great coach to be) and Théodore Szkudlapski) (37/8). Attackers were: André Hess (27/10), Serge Roy (32/12), Luc Cossou (24/18), Djibrill Karimou (27/8, from Togo) and Bert Carlier (33/8, from the Netherlands). Back row: Bessero (soigneur), Kaelbel, Nowak, Hernandez, Casolari, Biancheri, Garofalo, Thomas, Ludo, Leduc (coach). Fronrt row: Djibrill, Cossou, Hess, Roy, Hidalgo, Theo, Carlier. After this second success (the club had already won the French Cup a year earlier), the club collected another six French championships (1963, 1978, 1982, 1988, 1997, 2000) and five Coupe de France.